Mamma Mia! Here We Go Again, the sequel to the 2008 hit, had its advanced premiere in Pula Arena, on the eighth day of the 65th Pula Film Festival. From July 22nd to 25th, the film, which was mostly shot on the island of Vis, will screen at summer cinemas across the Adriatic. The film heads into regular cinema distribution on July 26th. 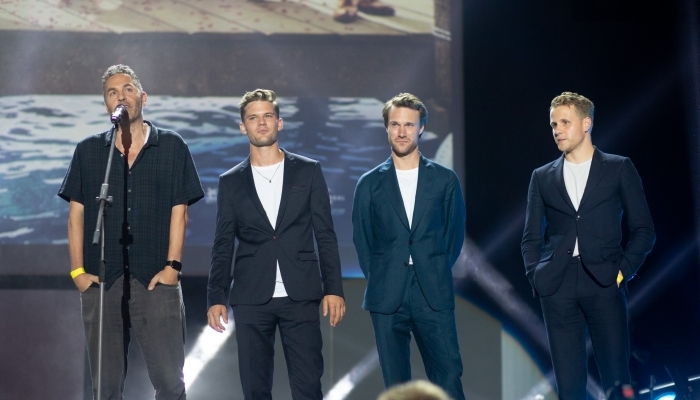 The special screening in Pula Arena was attended by the film’s writer and director, Ol Parker, as well as actors Jeremy Irvine, Josh Dylan and Hugh Skinner. Mamma Mia! Here We Go Again was mostly shot on Vis, where the cast and crew spent 24 days. At a press conference held before the screening in Pula’s Amphitheatre, the director and actors complimented the more than 270 film professionals and extras who were engaged on set. After its premiere in Pula Arena, the film will screen at summer cinemas across the Adriatic: Komiža 23.7., Vis 23.7., Opatija 25.7., Dubrovnik 22.7., Mali Lošinj 22.7., Brač (Supetar) 25.7., Bol 23.7., Hvar 22.7., Split (Bačvice) 24.7., Biograd na Moru 23.7., Rab 22.7., Murter 22.7. Mamma Mia! Here We Go Again will begin regular cinema distribution on July 26th. The Master Butcher's Singing Club is currently being filmed in Croatia and is the first foreign production using incentives for filming in regions of particular national interest.